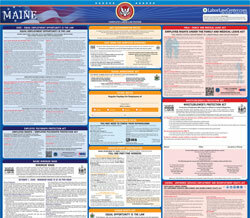 The Video Display Terminal Poster is a job safety law poster by the Maine Department Of Labor. This poster is mandatory for some employers, including employers who use computers in the workplace. This poster must be posted in a conspicuous place where all employees will see it in any workplace where employers use computers. This poster describes how to use a computer safely, how often to get trained on computer safety and where to contact about additional information on computer safety. It appears you don't have a PDF plugin for this browser. Please see the link below to download maine-vdtposter.pdf. people who use computers for work. 1. Train	you	to	use	your	computer	safely	so	you	\fon’t	get	hurt. 2. Train	you	the	right	\fay	to	adjust	your	\forkstation. 3. Train	you	\fithin	the	first	month	after	you	are	hired	and	then	once	 a	year.